Happy Monday! If you’re at work you probably wish you were somewhere a little more fun. Unfortunately, if you’re at work, you probably need to be but that doesn’t mean you can’t dream of something more exciting. Check out these free retro space posters, print your favorites out for free and dream of a vacation that spans the solar system. These cool posters are a free gift from NASA to remind us that even though their mission is to explore the universe, they still love us back here on Earth. 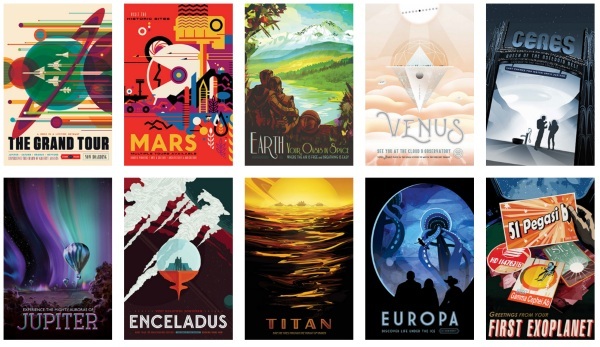 The posters are retro travel takes on various celestial bodies. They’re done in a variety of styles so whether you’re a 50s propaganda fan or more of a classic science fiction type of person, you’ll be able to find one for you. They’re totally free to download and print out for personal use. Head to your local copy shop and get a sweet full size poster for the cost of printing. Check out the website for a full view of the work and the downloads.